During his earthly ministry, Jesus was shockingly intent on offering the world freedom and life. When it came to rescuing the lost, forgiving sinners, consoling the hurt, welcoming strangers, mending divisions, refreshing the exhausted, and releasing captives, nothing took precedence over freedom and life—not reason, law, moral codes, politeness, political expediency, fiscal prudence, or maintaining family harmony. Jesus never preached, prayed, commanded or did anything in the name of God that constricted a human heart, afflicted a human body, narrowed or embittered a human mind, or chained the human conscience. He was, he is, nothing but freedom and life. And so it brings us up short every year in Holy Week to see him taken, bound, tortured, defeated, paraded around, nailed up, pierced, dead. It disturbs us to hear him groan wildly, like all vulnerable and tortured people do, desperate to know whether the Minder of Life, so mindful of others, has any memory of him. But it should not surprise us that the moment he dies, the dead live. 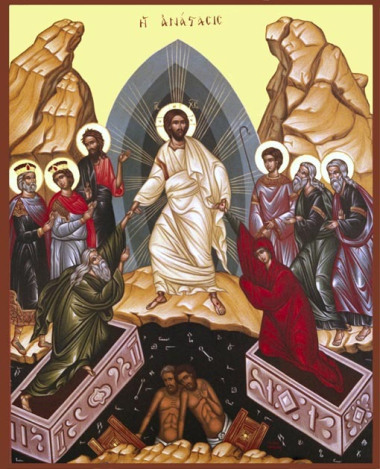 According to a tradition enshrined in the earliest Christian creeds, and still pointedly celebrated by the Orthodox, the first thing the dead Jesus does is “descend to the dead.’’ On Holy Saturday, he heads down into the haunts of the long-gone. There he comes face to face with the given-up-on—all his hopeless, ungraced ancestors languishing under the earth—and he preaches the gospel to them. 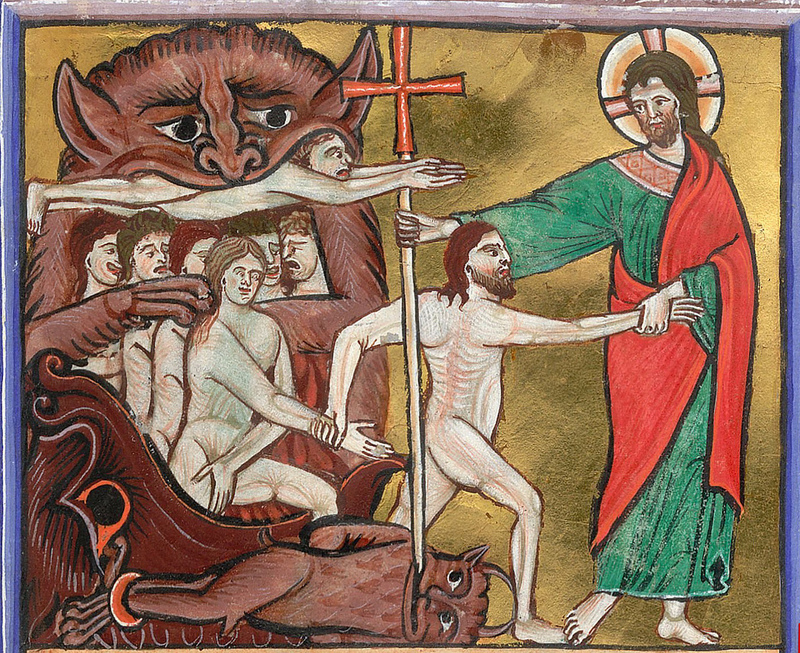 He springs from death his fellow-dead, he “harrows” Hell, he wrests them from the grip of all that would hold them back from life, he carries them away with him, and souls too long consigned to oblivion enter the joy of the living. Even before Jesus is raised, there is so much life still left in his love for us that it cannot help itself: it keeps intruding into forsaken places. It keeps finding lost things, it keeps bringing them home. What, then, about us who, in our peculiar ways, are shades inhabiting our own indistinct valleys, nether regions of self-concern and self-importance? What about us who languish in the hell of that sophisticated hopelessness we call cynicism, or who are just plain done in by the enormity of justice’s demands? What about us who hide our pain under our privilege, and who cannot for the life of us break the chain of hurts received and hurts inflicted? 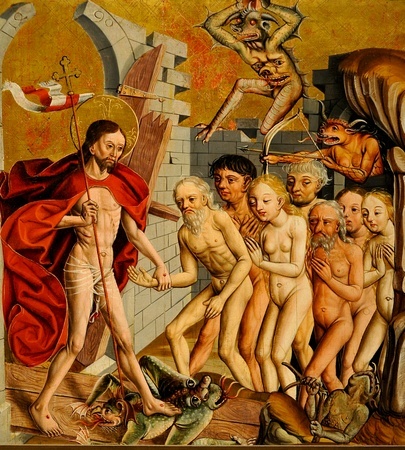 On this Holy Saturday, and on all our lonely forsaken Holy Saturdays , shall we let the dead Jesus come down to us, to whatever Sheol we have been consigned by life and pride and fear, defeat our demons, and take us with him from shade to light? Dazzled by our rescue, still carrying our shrouds as evidence, will we go about our own cities, giddy and pink with his new breath in our lungs, opened eyes lit by the power of death-defying love? Will we show up in these streets, announcing to all the good news he preached to us—that God loves life fiercely and will not abide anything that constricts a heart, afflicts a body, narrows or embitters a mind, traps a conscience, or seals a human being in a grave? If we knew that neither grave nor Hades could ever hold us again, would civility, law, caution, politeness, harmony, morality, political expediency, fiscal prudence, or anything else ever shame us away from the gospel? This entry was posted in Easter and Eastertide, Miscellaneous Commentary, Sermons on March 23, 2013 by sicutlocutusest.